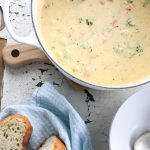 Panera Copycat Broccoli Cheddar Soup in less than 30 minutes! All of your favorite veggies in one cheesy delicious soup. If you love Panera, you’re going to love making this soup at home. Panera Broccoli Cheddar Soup is filling and cheesy but not the gloppy-overly-salty-processed-cheese type of soup you find in so many restaurants. Most of those recipes include processed cheese in some form. 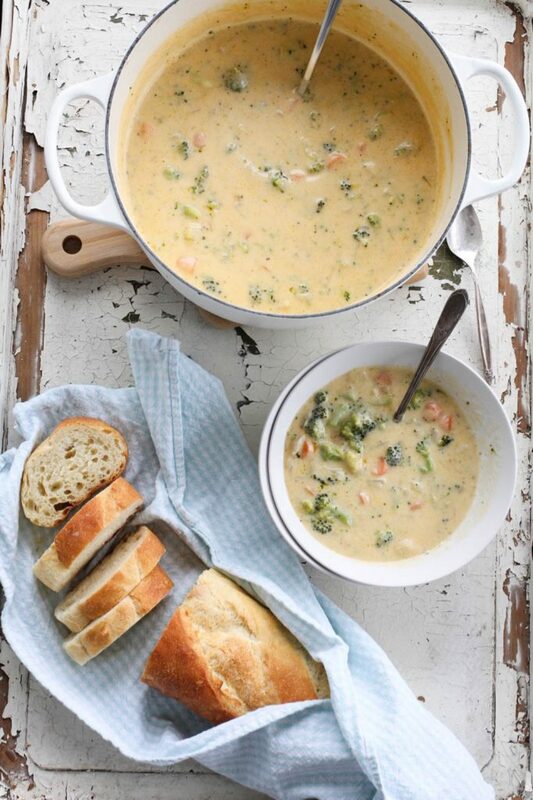 You won’t find any processed cheese in this recipe for Panera Copycat Broccoli Cheddar Soup. Sharp grated cheese and vegetables are center stage in this recipe. When I set out to a make a homemade version of this popular soup, I looked at several recipes that claim to duplicate Panera’s recipe. Many of those recipes left out (little, but significant) ingredients, like a bit of mustard, hot pepper sauce, or paprika, which are all listed as ingredients in Panera’s soup. So, I made my own version- a one pot, less than 30 minute recipe! This soup tastes like Panera in your own kitchen, but slightly better. Everything is better home made! You won’t believe how easy it is to make this delicious soup at home. If you can chop veggies and grate cheese, you can make this soup. I promise everyone from young kids to your grandparents will love this filling soup. 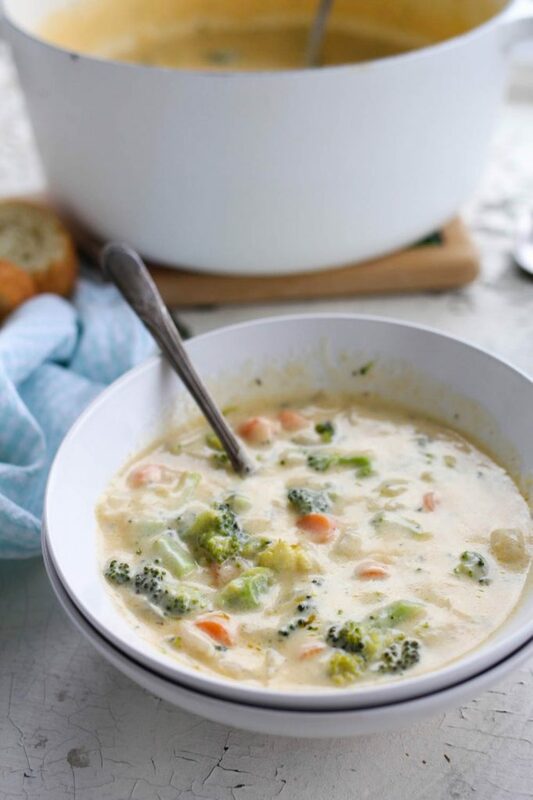 This cheddar broccoli soup is packed with onion, carrots, broccoli, sharp cheddar cheese, spices, and a bit of cream. It’s the perfect pick-me-up on a cold day and the best type of comfort food for weeknights or an easy weekend meal! Try making these soft herb breadsticks to go along with the soup. Or these cheese and garlic twisted breadsticks. Both bread recipes are perfect for soup dipping! 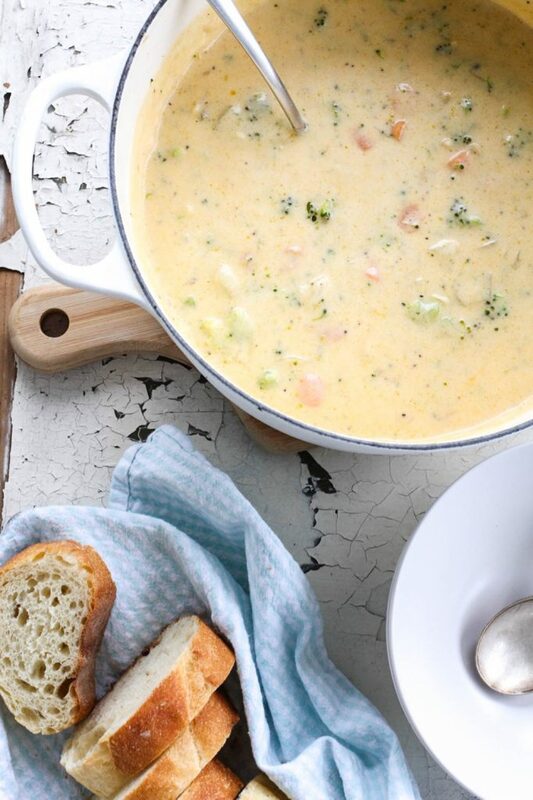 ​Panera Copycat Broccoli Cheddar Soup is a make at home version of Panera's most popular soup! 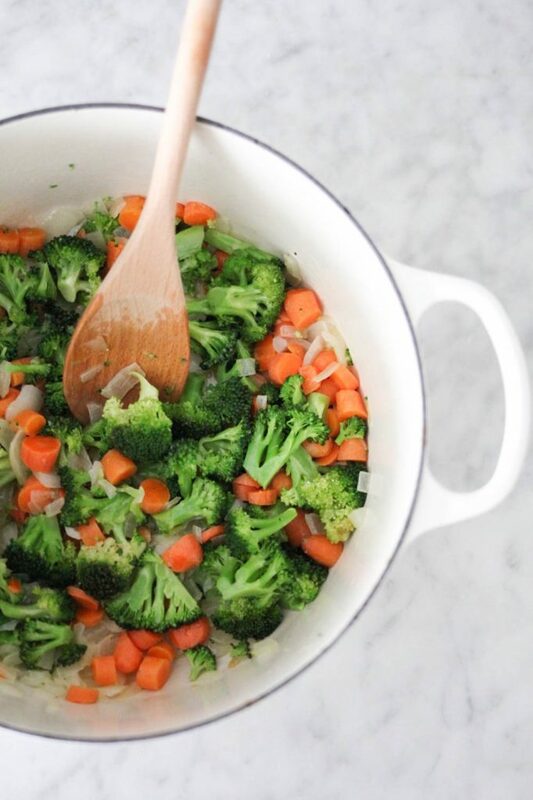 Filled with broccoli, carrots and cheese this recipe is a one-pot easy to make meal. Melt butter in large stockpot. Add onions and cook until soft, about 4-5 minutes. Add carrots and broccoli cook for additional 3-4 minutes, season with salt, pepper, paprika and hot pepper sauce. Pour chicken broth and cream into vegetable mixture. Add one teaspoon mustard, whisk until smooth. In a small bowl or cup, whisk the 1/2 cold water (or additional broth) together with the cornstarch until smooth. Pour into the stockpot with the vegetable mixture. Whisk until smooth. Add additional salt and pepper to taste. Add cheese and cook just until cheese is melted. Sharp or extra sharp cheese is best for this recipe. If you want to make a heartier soup, cook a couple of chicken breast halves and shred or chop before adding to the finished soup. Awesome! We love Panera too! I pinned this one Si. It looks even better than Paneras. Thanks Bonnie! I think it's always better at home, as I know you do too! Yum!! My parents live in Farmington and every time they cone visit me in Seattle we have to make a stop at panera….???? Thanks for dinner tonight!! I am pregnant and cant plan meals ahead right now to save my life….this looks good and I don't need to hit the g. store!!! Love everything you share!!! Have a good one! Thanks Jen! I wish we had Panera here, Im a big fan of their breads. Such a fun lunch spot! Hope all is well with your pregnancy. It is hard to stay motivated to cook when you're dealing with being pregnant! Looks delicious! About those yummy-looking breadsticks–are you going to share the recipe for those, or have you already? I would love it!! Thanks! I have not shared that recipe yet, but will make sure to do it soon. I tis really simple and one I throw together when I'm in a hurry. Thanks for the reminder! Those breadsticks look super yummy! I would love to have the recipe. Yum this looks delicious! And Gluten Free! Definetly a soup day today. I think this recipe will work with frozen broccoli, not as good as fresh, I would chop the pieces small. Let us know if you try it with frozen! I made it tonight with Costco’s frozen broccoli and it was incredible. I let the broccoli thaw and then cut it up and added it after the carrots had cooked for a bit. Everyone loved the soup! I loved this recipe! Easy too! Thank you! I just made this soup for this first time and it’s delicious!! Definitely will be making it again. My kids were fighting over who had more 🙂 Thank you!! Thanks so much April! I made this last night as well. Always a favorite here! I whipped this up for quick dinner and it really hit the spot for my family. I was out of baby carrots so I added celery. It’s just the right amount of cheese and the chicken broth gives it a delicious flavor. We loved that the broccoli was still crunchy and delicious too. Thanks for the great idea. As usual. I made this for dinner tonight and it was delicious! Someone asked about frozen broccoli….I had frozen some roasted broccoli a few weeks ago and used it. I just added it (I gave it an extra chop, but it was still slightly frozen)after the carrots and onions were softened. It worked great! And, just a reminder…don’t let boil after you add the milk or it can funny. We will definitely make again!! Thanks for you tips, Christina and thanks for reading ABK! My whole family loves this soup! I love that all of my picky eaters will fill up their bowls. We especially love dipping the twisted breadsticks in it. 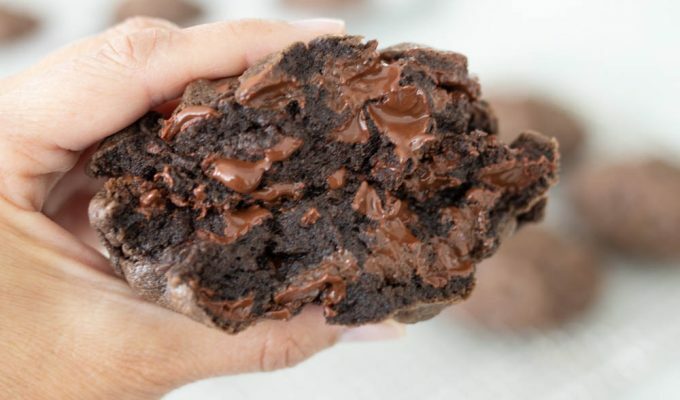 This recipe is so quick and simple to make. I usually have the ingredients on hand, so it is one of our go-to hearty meals in a pinch! Thank you!! We love love love this soup!!! My picky 3 year old asks for it daily! It’s one of the only things he will eat. We make it weekly and love how quick and easy it is. I always have the things needed on hand. Thank You Si!!! This recipe is perfect, even for the pickiest of eaters. I love how easy it is to make too, MJ. Thanks for sharing and for reading ABK! I made this last night for my husband whose favorite soup is Panera’s Broccoli Cheddar and it was a hit! I made it exactly as directed and it was so creamy and delicious and a crowd pleaser… even the kids loved it. Thank you so much for the recipe. This will be one of our go-tos from now on. I’m so glad your family enjoyed it, Marlene. It’s one of our favorite soups to make too. Thanks for sharing! I made this the first time, for a friend, and it turned out perfectly! So perfect that she told me her daughter’s favorite restaurant was Bread Co. (Panera to everyone outside of St. Louis) and her daughter said it was even better. I was pleasantly surprised. 🙂 I made it the next night for my family and let it sit just a tad too long with after the cream/half&half was added and it flopped so I learned that part of the instructions were really important. Third time’s a charm as I’ll be making this over and over again! Thanks Si! This was so so so good! We had some extra ham from Sunday dinner so we threw it in. I doubled this recipe for our family of 10. I cooked it in the Instant Pot on sauté mode and we ended up toasting some Grandma Sycamore bread to go with it and had a green salad. Fabulous dinner! No leftovers whatsoever! Thank you for the recipe-I’ll add it to our regular rotation! I love finding food that’s a hit with our gang of teenagers, middles, and littles!